ePublishing Knowledge BaseePublishing Knowledge BaseePublishing Knowledge Base EditorialHow do I lock an article to requiring a reader login, register, or have a current subscription? Sometimes you’ll want your article to be available only if a user is a registered user or if they have current subscription to the site / paid newsletter / publication. On your site, a simple taxonomy selection is all that is needed when setting up the content. This is available to all content on the site. You can lock content to being available to a registered user. Or only be available to a current subscriber. Access to content can be controlled by selecting the Classification taxonomy as Require Registration within the relevant tool for the content type. If the content should only be available to current subscribers, use the Classification Require Subscription within the Supplemental subform, for tools with this subform, or on the General entry form for the content. Create the article or content that you want to require registration for. Learn how to create an article here: How do I create an article? If you wish to just collect basic reader data only (name, company, contact information), use the Require Registration taxonomy in either the Article Manager (shown below) or the Media Manager. 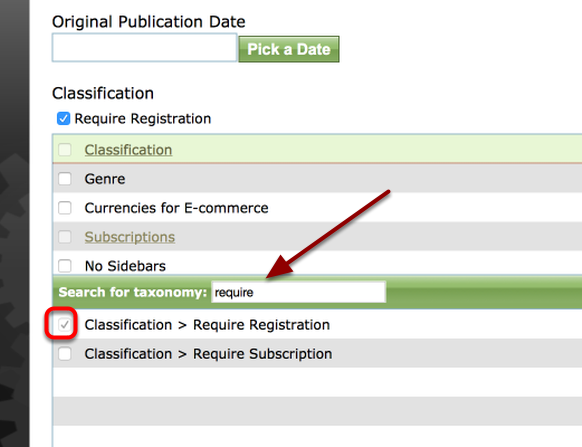 You can enter Require into the Search for taxonomy field to quickly find potential matches. When the reader clicks on your file or article link, he will be asked to log-in to view the restricted content download the requested file. If the reader has not previously registered, he will be asked to do so. You can then access reports that document who accessed that file; the reports include names, emails and physical addresses (when relevant), along with when the file was downloaded. The reader will be asked to login or create an account, if they haven't already done so. Once logged in, they will be able to see the desired content without any further delays. The reader will be asked to login or subscribe to see the content. If they are logged in, but do not have a subscription to the site or the desired publication / paid newsletter, then they see a message that encourages them to subscribe. What is the difference between Media Manager vs. Article Manager requiring the registration? If the content is locked to Require Registration, then any attempts to view the content, watch the video, listen to the file will check to see if the user is currently logged in. If so, they are granted access. We record their access to cotent or view the video and you have their user information to provide to the sponsor. If they are not logged in, they are taken to the log in screen and either log in, or create a new registration to gain access to the file. Once they successfully log in or create the new registration, they will be able to view the content or view the video. If the Article Manager article is locked to Require Registration, then any attempts to view the article will check to see if the user is currently logged in. If so, they are granted access. We record their access to the article for future reporting purposes. If they are not logged in, they are taken to the log in screen and either log in, or create a new registration to gain access to the file. Once they successfully log in or create the new registration, they will be able to read the article. Prev: How do I control my comments? Can I moderate them? Next: How do I manage Canonical Tags?